The concept of multiculturalism is divisive, encourages racial hatred and may have helped to produce the 7 July suicide bombers, a new report argues. The report from right-wing think-tank, Civitas, criticises those who say no one culture is better than any other and celebrate difference. It said such people often "shy away from celebrating" Western culture "for fear of causing offence". The Muslim Council of Britain said such views were "fanciful and offensive". 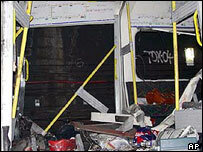 "London's cosmopolitan mix gives lie to the idea that multiculturalism has been a failure," a spokesman said. He said groups were using the excuse of the 7 July attacks to "renew their assault on the idea of a multicultural society". A recent study found 7.53% of Britain's 2001 population had been born overseas. The findings, from the Institute for Public Policy Research, marked an increase from 5.75% in 1991. Meanwhile, the Civitas report, entitled The Poverty of Multiculturalism, criticises "hard" multiculturalists who "assert that no culture is better than another but they will happily elaborate that Western culture is actually inferior". Its author, Patrick West, suggests no society can survive unless its members subscribed to a set of core values, whereas multiculturalists encourage minorities to see themselves as separate. The report also suggests that the political concept fosters racial divides and even hatred. "The fruits of 30 years of state endorsed multiculturalism have increased inter-racial tension and inter-racial sectarianism," the report said. "The fact that the London suicide bombers of July 7 and the would-be bombers of July 21 were born and bred in Britain - and encouraged by the state to be different - illustrates that hard multiculturalism has the capacity to be not only divisive but decidedly lethal." Trevor Phillips, head of the Commission for Racial Equality, has already caused controversy by suggesting that multiculturalism may now be outdated. Earlier in the month, he also warned that Britain could be "sleep-walking" towards US-style ethnic segregation because of a failure to address differences and create common values. That speech was however criticised by some minorities and experts who said the evidence he claimed for segregation in towns and cities was not clear cut.